A recent study shows that invasive vines are choking out rainforest trees, preventing the uptake of carbon dioxide from the atmosphere. Researchers from the University of Nottingham have found that the vines scaling the rainforest canopies are causing serious disturbances in the balance of carbon in rainforests around the world. According to a press release from Eurekalert, these vines are causing the death of a large number of trees in tropical climates. Rainforests are essential in keeping the global carbon cycle moving. Massive rainforest trees are one of the primary sources of carbon uptake on the planet. As they absorb carbon dioxide from the air through their leaves as a key ingredient in synthesizing glucose, they incorporate atmospheric carbon into new cells. The study was published in the Proceedings of the National Academy of Sciences, and lead author Dr. Geertje van der Heijden found evidence that woody climbing vines called lianas are preventing trees from absorbing carbon on a massive scale. Rainforests store roughly one third of all of the world’s total carbon, and sequester roughly 40 percent of the carbon in the atmosphere. In the past few decades, liana growth has exploded in many equatorial regions, and they are choking out trees, preventing carbon uptake and thus the photosynthesis that sustains them. 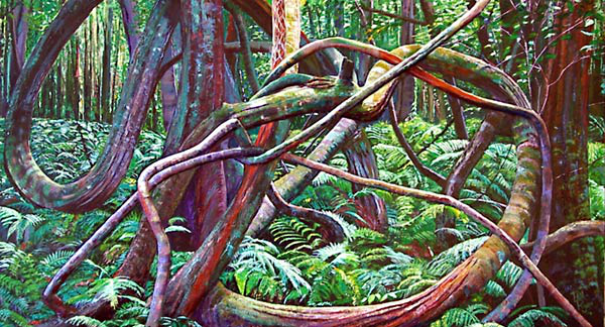 The researchers carried out a three-year experiment in Panama by removing lianas from eight 80-square-meter plots in the rainforest and comparing overall tree growth to eight plots where lianas grew freely. The plots with lianas growing in them stored 76 percent less carbon in the form of woody biomass compared to the trees that had the vines removed. Reduced tree growth and subsequent death of trees contributed to the reduction in stored carbon. Dr. van de Heijden, a professor at the University of Nottingham School of Geography, said that lianas are creating a net increase in the overall atmospheric carbon by killing trees. What’s worse is that these woody vines are increasing in numbers in size in the rainforests throughout Central and South America, which store a large percentage of the world’s carbon. The professor hopes that the study’s findings will help inform future climate models, and improve predictions about how to successfully manage vegetation in these critical areas.